Rising among the small lakes and creeks high in the Laurentian Highlands, the worn remains of the world’s oldest mountains, this wild river begins amidst folded granite hills, first wandering through small ponds and bea, this wild river begins amidst folded granite hills, first wandering through small ponds and beaponds and beaver swamps then flowing through almost 100 km of lazy current mixed with mildly technical fastwater and rapids. 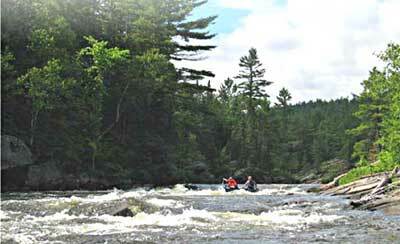 Wildlife abounds withs then flowing through almost 100 km of lazy current mixed with mildltechnical fastwater and rapids. Wildlife abounds with moose, black bear, fox and mink on the shore while the river supports abundant otter, turtles and beaver. 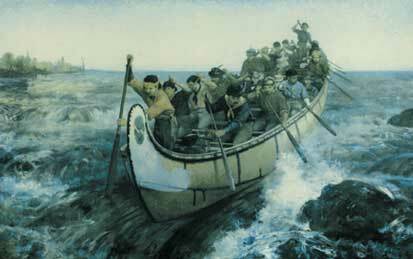 Of cultural and historic significance since the French began direct trade with the Hurons, in the early 1600's, rivers such as the Noire and Ottawwa became routes for the Montreal based fur trade with the west. In the late 19th century the upper portions of the Noire were still travelled by Ojibwa family groups. With the depletion of the fur industry in the early 1800’sr industry in the early 1800’s the timber trade and logging became the dominant economic activity. In time the rivers have cleared, the forest and wildlife rebounded, and wilderness has returned. Accessed by float plane out of Rapides des Joachims, the river has stable water flow throughout the summer due to a holding dam on the feeding lakes. With a constant gradient totalling about 350' over 110 kilometers, the Noire is well suited for a wide range of paddlers interested in a wild Quebec river that is moderate in both diffii difficulty and cost. 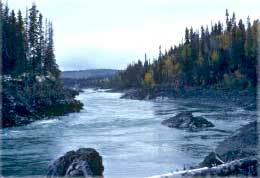 The spectacularly beautiful Snake River races northward - for over 300 kilometers -towards the Arctic Circle, through the austerely magnificent northernmost reaches of the sub-arctic Yukon high country. 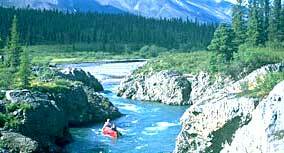 Sharply sculpted peaks, midnight sun, and virtually continuous Class II-III whitewater - from the remote float plane put in at Duo Lake, make this the perfect whitewater river. 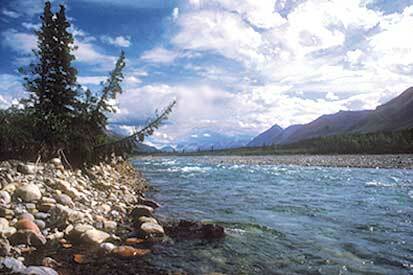 “Guide’s Choice” as one of the best wilderness canoeing rivers in Canada! Amazing scenery, dramatic canyons, class I - III whitewater, and pristine northern wilderness make this a classic river trip for the intermediate paddler. Caribou, Dall’s sheep, fascinating Tuufa formations and natural springs add to the interest. A remote wilderness trip in the historic Klondike goldrush country of the southern Yukon just north of British Columbia. Floatplane in & paddle out, winding through forested mountains on a crystal clear river with pools chock full of bull trout and Arctic grayling. A superb canoe camping. 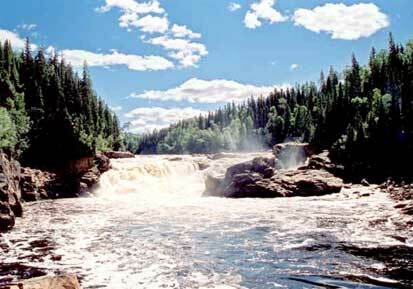 The wild, majestic Missinaibi River is one of the longest free-flowing wilderness waterways in Ontario. Experienced canoeists can paddle and camp this historic fur-trading route to James Bay and relive the days of old. Abundant wildlife and excellent fishing. The return trip from James Bay is via train - the famous Polar Bear Express out of Moosonee. Immense and powerful, the Harricanaw is one of James Bay’s mighty rivers - rising in the wilderness of west central Quebec. Often a kilometer wide, then narrowing to dramatic gorges, the river features miles of shallow limestone rapids, spectacular waterfalls, panoramic campsites, and dozens of class II rapids. Return via train - the Polar Bear Express.